The Roland HP-201 is an 88-tone digital piano with weighted keys and 128-tone polyphony. For an enhanced experience it offers four levels of touch sensitivity. The device includes a number of adjustable features for total control in addition to USB MIDI connections. The Roland HP-201 features the PHA II keyboard. This model offers a genuine acoustic grand feel by providing the same natural response found in the real instrument. The weighted keys are heavier in the lower range while lighter for higher tones. This technology offers lighter resistance on pianissimo portions and stronger resistance on fortissimo passages just like an acoustic piano would. The Roland HP-201 offers its best authentic acoustic piano sound with 88 keys of real resonance. Each tone has multiple samples of its own and the touch response means each key reacts to the slightest pressure from the lower tones to the delicate treble tones. The HP-201 provides flawless continuing damper pedal control. This control allows for perfect damper effect management with each performance for enhanced expression and mastery. The unit can download and play files in MIDI format by connecting the piano to a computer via the USB MIDI port. There are 65 songs included with the piano as well. The Roland HP-201 comes with an elegant cabinet that enhances its appearance. The front legs make the piano look that much more authentic. The digital instrument is made with a mahogany finish. The HP-201 digital piano offers a maximum polyphony of 128 tones. This is one of the highest polyphony tones among most popular digital pianos. You can find a higher polyphony that will have a maximum of 256 tones in some best digital pianos, but the price tag will be much higher as well. The higher the maximum polyphony the greater the chance the player has of expressing individual notes without risk of them being masked by other tones or clipped in the middle of play. This allows the user to play complex or speedy passages without compromising representation among individual tones. The HP-201 offers 285 total sounds. This includes all tones, instrument voices and instrument modes the digital piano has available in its database. The HP-201 offers Twin Piano Mode that splits the keyboard into separate halves in order to facilitate instruction. Both teacher and student benefit from using their own keyboard. It comes with a number of features built-in such as its metronome, music stand and pedals, among others. The piano’s damper pedal offers continuous control allowing the player the perfect increase or reduction during any performance. The best part of the device is its improved keyboard. Not only it is one of the best weighted keyboards on the market, it also shows a wider dynamic range with multiple sound samples for every tone. Twin Piano Mode – The piano features Twin Piano Mode to allow the instrument to be used by two players at once. This makes it easier for students and teachers to use two halves of the piano at once for instruction. Damper Pedal – The unit’s damper pedal enhances the acoustic similarity with continuous effect giving way to better expression. Authentic Sound Samples – The HP-201 features a PHA II keyboard with an improved and broader dynamic range. The keyboard also features 88 keys each with multiple sound samples of their own. Inclusions – The Roland HP-201 comes with many features built into its system as standard features, including the following: metronome, speakers, MIDI port, USB port, pedals, music stand. Speakers – The only problem users mention is the sound quality of the speakers. Some feel the included speakers lack vitality and compromise the experience. This problem can be treated by placing the piano a few feet away from the closest wall. 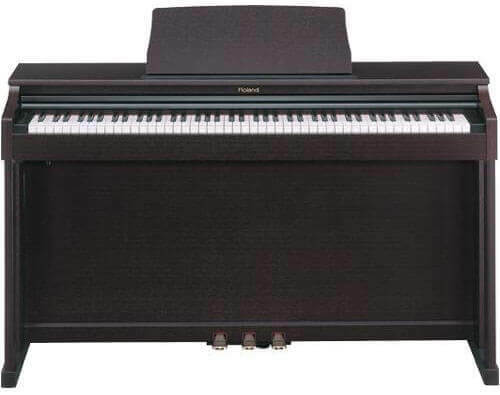 The Roland HP-201 offers various features the average piano player would need for impressive performance. It provides the user with total control in addition to including effects that are overlooked in many models.